Nairobi - Mrs. Dekha Ibrahim Abdi is a veteran of years of civil right activism and a community peace builder from the marginal Muslim region of Northeastern Kenya, a region devastated by years of inter-clan conflicts. Her veil frames a no-nonsense face, but also a gentle one that glitters with hope and determination. Because of her aspirations to rid war and conflict she recently received international recognition after winning the prestigious Hessen 2009 peace award in Germany. "Iranian women are very powerful, and they want their freedom..."
“I think it is electrifying in the sense that I was getting recognition from the world as a person and above all as a Muslim woman who has contributed to peace building in contemporary times,” she said. “It has never been an easy venture to preach peace in our province, but all the while we had to rise above all obstacles to realize sanity.” Two decades ago when, she first started setting her pace towards peace building, much of her region was groaning under the weight of protracted conflict fueled by scarcity of resources such as water and pasture. “In those days, women, the aged and children were the most vulnerable groups in tribal conflicts and so we believed that we should make our voices heard to end what seemed an endless destruction.” And so, in the face of death and destruction, she started holding peace vigils with signs saying “war is not the answer but peace.” Soon she formed the formed Wajir Peace Group. Over the past few years Northeastern Kenya has become one of the most peaceful regions in the politically-polarized East African country, not least due to Mrs. Dekha Ibrahim Abdi’s efforts. 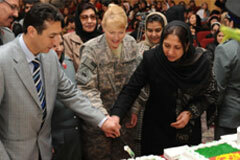 Kabul - Col. Shafiqa Quraishi has an improbable dream. It is that, before too long, women will assume command positions in the Afghan National Police. A policewoman for 28 years, Quraishi is a towering exception in a country where most women dare not leave their homes without their husband’s or father’s permission, and then only if cloaked from head-to-toe in the infamous, shapeless, anonymous, usually powder-blue dress known as a burka. “No one will give your rights to you as a gift, you have to take them,” Quraishi told about 300 women who, most unusually for Afghanistan, all had their faces uncovered at a recent ceremony to mark International Women’s Day. It is such brave talk, in a country where women are seldom seen, let alone heard, that led U.S. Secretary of State Hillary Clinton to name Quraishi, the scope of whose duties includes gender issues, women’s rights and children, as a winner of the 2010 International Woman of Courage Award. Sadiqa Basiri Saleem, recipient of the Rising Voices Award, says: "My dream is to see my sisters well-educated in a peaceful Afghanistan. They should be able to raise their voices to get their rights since I can’t stand seeing them tortured and murdered in the name of honor any more." Two Emirati women held the UAE’s flag high on the tallest free-standing mountain in the world, Mount Kilimanjaro, in Tanzania, on February 7. Dr Nawal Khalifa Al Hosani, Associate Manager of Sustainability, Abu Dhabi Future Energy Company and Ruba Yousif Al Hassan, Advisor at the Social Development Department of the Abu Dhabi Executive Council in Abu Dhabi, climbed the 5,895-metre tall mountain facing several dangers on their way to the top. The expedition took eight days and the women had to battle freezing temperatures, volcanic areas and dangerous cliffs. But the brave women carried on. “We forgot everything once we reached our destination, next to a sign saying the top of the world’s highest free-standing mountain,” her compatriot Al Hosani said. 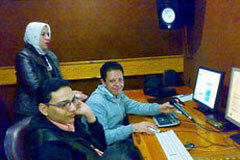 Mahasin Saber wants her “Radio for divorced women” to put the spotlight on the serious deficits in the male-dominated Egyptian society, and to make people aware of the discrimination suffered by women. So far, she’s succeeding. She founded her “Radio for divorced women” as a spin-off of her blog “I want a divorce.” She founded the blog two years ago after her own divorce, and used it to report on her long march through the various institutions on her way to getting her divorce. Saber wants to break down prejudice by giving divorced women a voice and removing inaccurate perceptions. Afghan women’s rights defender Wazhma Frogh rubbed shoulders with Hillary Clinton and Michelle Obama when she won the 2009 US State Department’s International Women of Courage Award. Wazhma’s bold outspokenness for women, children and social justice has won international recognition and also seen the passing of Afghanistan’s new Elimination of Violence Against Women law. Men and women gathered on bridges in 18 countries in a symbolic effort to stand up for peace and development for women in war-torn nations. 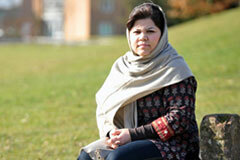 One such gathering of Afghan men and women in London marked International Women’s Day on March 8th. A group of Afghan men and women stand on the Westminster Bridge in London holding up a ‘Women for peace’ banner. As Londoners passed by, they signed the banner in a show of solidarity for women around the world - and especially in war zones. The white banner was soon full of their signatures, drawings and messages of peace. This is only one venue of the campaign called – “Join Me on the Bridge.” On the 99th anniversary of International Women’s Day, the campaign was intended to call for people to devote one day to stand for women from war devastated regions like Afghanistan, Congo, Rwanda and Iraq. Riyadh - For the first time in the Kingdom women handle editing, sub-editing, layout and design at a women’s journalism center at Al-Jazirah newspaper. “If the step is exclusive for Al-Jazirah, it is worthless,” says Al-Jazirah Editor in Chief Khaled Al-Malik, adding that the real value of such a step is to open the door for women to work in journalism, enable them to take control and pave the way for other newspapers to open more job opportunities for women journalists. Al-Malik agrees that other newspapers have women as editors, sub-editors, journalists and reporters, but he believes that it is not enough. “Women should work in all journalist-related jobs, and there are not many women who are specialized in areas such as sub-editing and photography,” he added. “All that is provided to male journalists and reporters is also provided to women,” says Al-Malik, stressing that the newspaper’s aim is to offer women the opportunity to become active members and partners in the development of the Kingdom.